With all the dressing-up, candy, and mischief around Halloween-time, it’s obvious why the holiday is such a hit with kids. But, after the kids are in bed, tired from trick-or-treating and crashing from their sugar “highs,” it’s time for the grown-ups to have some fun, too. “The Rocky Horror Picture Show”: 8 p.m. Oct. 26-28 and 31, The ARTS at Marks Garage, 1159 Nuuanu Ave. Watch the 1975 cult classic starring Susan Sarandon, Tim Curry and Meat Loaf. Costumes are encouraged, with interactive prop boxes available for purchase. Tickets: $20 presale, $25 at the door. Call 521-2903 or visit artsatmarks.com. 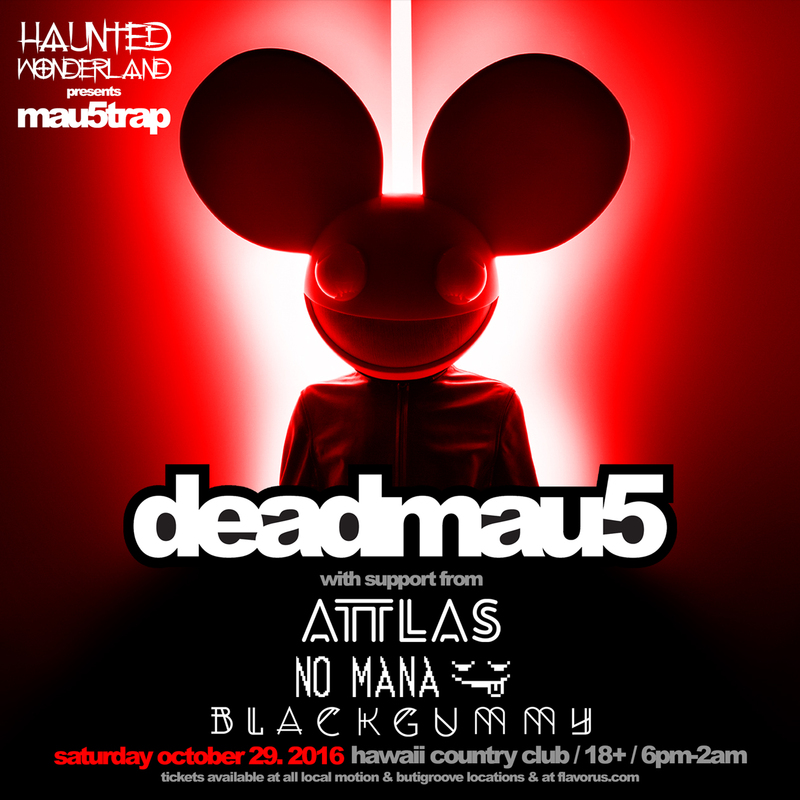 Haunted Wonderland with deadmau5: Oct. 29, 6 p.m. to 2 a.m. at Hawaii Country Club, 94-1211 Kunia Road. Performance by Grammy-nominated electronic music producer who is always in costume, with Attlas, No Mana and Black Gummy. Ages 18 and older. Cost: $65 plus $8.42 service fee; tickets at Local Motion and Butigroove stores and flavorus.com. Head to the Hard Rock Cafe in Honolulu for the Paradise City event, which is a ’90s rock-themed event that includes a costume contest with a $2,016 cash prize, giveaways, music by Yooey and DJ Delve and surprise guests. Hallowbaloo Music & Arts Festival: Oct. 29, with Street Festival from 4:30 to 10 p.m. featuring costumes, music, art and food at Hawaii State Art Museum and surrounding areas on Hotel and Richards streets. Club Hallowballoo, 9 p.m. to 2 a.m., expands to include Chinatown and Aloha Tower Marketplace venues, with free trolley service connecting each area from 8 to 11 p.m. Entertainment lineup includes DJ Lo Down Loretta Brown (aka Erykah Badu) and beats until 2 a.m. at Square Barrels, Scarlet Honolulu, The ARTS at Marks Garage, Manifest, Downbeat Lounge, NextDoor, Bar 35, Hooters, Nashville Waikiki and Gordon Biersch. For ages 21 and older. Cost: Street Festival only, $15 before 7 p.m., $30 after; combined tickets for both events, $15 to $30; Hallowbaloo Ball (includes pupu, two beverages, VIP entry into venues), $80. Produced by T-Rx Entertainment, LLC. Visit hallowbaloo.com. “Superheroes”: 8 p.m. Oct. 29, Lola’s Grill and Pupu Bar, 1108 Keeaumoku St., with live classic rock music by Spicy Tuna. For ages 21 and older. 808 Cleanups Halloween Fundraiser: 6 to 10 p.m. Oct. 30, Honolulu Club, 932 Ward Ave. Features costume contest, games, DJ and prize drawings. Cost (includes one drink, light pupu and five-hour parking): $50. Visit 808ne.ws/2cQBHnp. Halloween at the Hyatt: “Bad vs. Evil,” Oct. 31, kicks off at 8 p.m. at Hyatt Regency Waikiki Beach Resort and Spa, 2424 Kalakaua Ave., followed by after-party at District Nightclub. Costume celebration pays tribute to “Suicide Squad” with a costume contest, games, giveaways and more. For ages 21 and older. Presented by Racesauce Events and Element Group. Cost: $10, $20 for VIP. For tickets, visit events.racesauce.com. “Monster Mash”: 8 p.m. Oct. 31, Lola’s Grill and Pupu Bar, 1108 Keeaumoku St., with live dance and oldies music by Johnny Rock Society; $5 cover charge to enter Halloween costume contest. At the Haunted Wonderland event, you can enjoy a performance by Grammy-nominated electronic music producer who is always in costume, with Attlas, No Mana and Black Gummy. Paradise City at Hard Rock Cafe Honolulu: Oct. 31, kicks off at 9 p.m., 280 Beachwalk Ave. This ’90s rock-themed event includes costume contest with a $2,016 cash prize, giveaways, music by Yooey and DJ Delve and surprise guests. For ages 21 and older. Presented by Flash Hansen, Blaise Saito and Vertical Junkies. Cost: $15 presale, $20 at the door. For tickets, visit flavorus.com/hrchonolulu2016. Call 921-2244 or visit hardrock.com/honolulu. Halloween party: Oct. 31, 8 p.m. to 2 a.m., Hula’s Bar & Lei Stand, 134 Kapahulu Ave., with costume contest at 11 p.m. For ages 21 and older. Advance tickets: $10 includes Fast Entry line. Call 923-0669 or visit hulas.com. Pacific Harp Project Halloween concert: Two shows Oct. 31, 6:30 and 9 p.m., Blue Note Hawaii, Outrigger Waikiki Beach Resort. With guest saxophonist Todd Yukumoto, “adult trick-or-treating” for music download cards and more. Tickets start at $15; kamaaina receive 15 percent discount. Recommended for students in high school and older. Call 777-4890 or visit bluenotehawaii.com. “Dearly Departed: Day of the Dead Celebration for Dia de los Muertos”: Nov. 2, Ong King Art Center, 184 N. King St. This ninth annual event pays homage to the deceased and one’s ancestors while serving as a fiesta for the living. Features music and dance, art installations, unique performances, open mic and costume award. Cost: $10. Presented by Willow Chang and Passport Productions. Call 292-0820. Don’t let Halloween pass you by just because you’re in Hawaii on vacation. Instead, attend one of these Halloween events in Hawaii and explore the spooky-side of paradise!